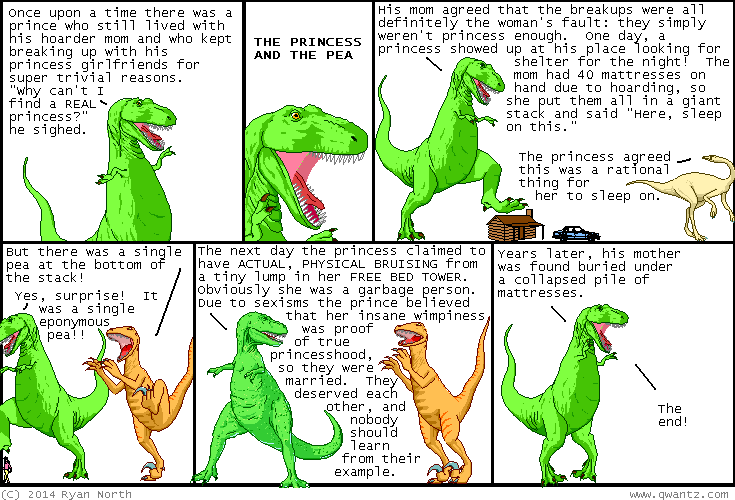 Dinosaur Comics - September 24th, 2014 - awesome fun times! –Let's assume the universe is deterministic!! September 24th, 2014: YOU GUYS, Todd emailed me to let me know we all forgot to change the footer here to the summer version, and now it's fall! And yes I absolutely said "we all" there as a way of diffusing blame across every single person who reads this comic. Anyway, it's too late for summer, but just in time for fall, so that's what we've got now. It's a really pretty fall scene that you can see if you scroll down to the very bottom of this page on a non-mobile device, THE END.